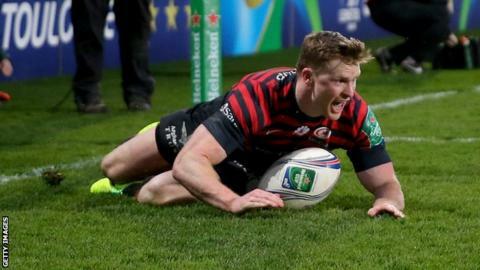 The 27-year-old scored two tries against Ulster to help set up a last-four meeting with Clermont Auvergne at Twickenham on Saturday. He is now targeting selection for England's summer tour of New Zealand. "I'm a great believer in everything happening for a reason," Ashton told BBC Radio 5 live. "I've got a couple of games left this season to put my hand up, and get back involved in New Zealand." With nine tries in the Heineken Cup this campaign, he is just one away from equalling the all-time tournament record for tries in a season. "These are the games I want to be involved in, it's another reason I came to this club," he said. "I'll take the try if it comes at the weekend, but if it doesn't, I won't be forcing my hand to get it." "As a team we have changed quite a lot, in the way we play and the personnel we have. The group knows each other a little bit more, and we've moved on to another level," he added. "I think we need to prove to ourselves more than anything else that we can go one step further." "Last time I spoke to Stuart, he said it's in my hands to get involved," said Ashton. "New Zealand's going to be a tough tour, and you want to be involved in that in the build up to the World Cup. I'm enjoying rugby again." "I'm only 27, I'd like to think I'm heading in to my prime and I've got a lot to offer still," he said. "Wing is a position where there are always new and up-and-coming players coming through. But the great players - like Brian O'Driscoll - always manage to stay in the team and on top of their game. "Those kind of setbacks have got to spur you on. That's why they are there, to push you on and improve. Hopefully my time will come again." Hear more from Ashton on 5 live Rugby on Thursday evening, BBC Radio 5live at 19:30 BST. There is commentary of Saracens against Clermont Auvergne on 5 live sports extra on Saturday from 15:25.